Taradel's mission is to help small businesses grow by providing agency quality marketing solutions at exceptional value. 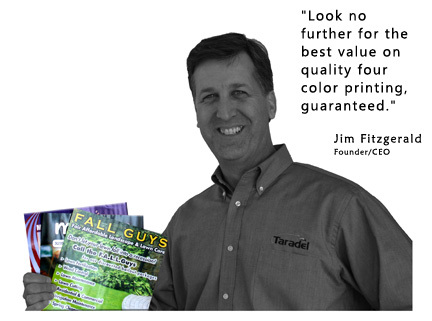 Hi, I'm Jim Fitzgerald, founder of Taradel and I'm going to make it easy for you to create and deliver a full color, glossy, printed ad directly to your target audience. Would you like your company's message delivered directly to your customer's home? To literally be delivered right to their doorsteps? Of course you do, but how do you get your message out there? Easy. With Taradel's high-quality design and print services you can produce professional quality advertising that looks as good as any "big agency" artwork - at a fraction of the price. Inexpensive. How about 10,000 full color, glossy flyers for $395? Nobody beats our prices - we leverage the power of bulk buying, printing your flyers at the same time that the national chains print theirs. Efficient. With our industry-specific library of resources and powerful tools to get your advertising project moving quickly. With easy access to our professional design services our on-line ordering system it just can't get any easier. In fact, it takes less time to set up and order than it does to explain how easy it is. Fast. One week, that's all it takes from receiving your design to seeing your customized flyers. And, if you choose one of our distribution options, you could see them in your hometown paper or mailbox in about three weeks. What are you waiting for? Take our website for a spin, just set up an account to get started immediately. Need some reassurance? Check out some testimonials and our very happy customers will tell you exactly what they think of the printing services at Taradel. Want samples of our work? Click the "Free Sample" button to the right and we'll get them out to you right away. If you have any questions, or if you need a custom quote, please give us a call toll free at 1-800-481-1656. We'll be happy to provide you with whatever you need to assure you that yes, it really is that easy. "I cannot say enough about the excellent care we received from Taradel...the design team was very patient and we are extremely satisfied with the results." "I run a non-profit theatre company. Magnets are great promotional items to promote our performances."